Screen legend, Me Taylor, wore a Helen Rose white satin confection embellished with seed pearls and beading which had taken a number of workers two months to complete. A sweetheart neckline was covered with a chiffon overlay to reveal just a hint of decolletage. 1950 - Conrad (Nicky) Hilton ... Elizabeth was only 18 years old when she married millionaire socialite hotel heir, who was Paris Hilton's great uncle. Unfortunately for the young star, Nicky was widely known as a domestic abuser, and the couple separated only seven months after the wedding. "I closed my eyes to the problems and walked radiantly down the isle", she said. 1952 - Michael Wilding ... While in London making the film Ivan Hoe, Liz met her second husband, a British movie star 20 years her senior. The couple had 2 sons, Michael Howard, born 6 Jan 1953, and Christopher Edward, born Feb 27, 1955. But they separated 19 july 1965. "The strains on our marriage were too much for it to survive", said Liz. "We were so very different. 1957 - Mike Todd ... She called the Broadway and film producer the "first great love of her life", and they wed at the beachfront estate of the groom's friend after a short courtship. The couple had a daughter together, Liza Elizabeth Francis, born August the 6th, 1957, but, tragically Mike died when their baby was just 7 months old. His plain, ironically named Lucky Liz, crashed in New Mexico while on route to a dinner in New York in his honour. Liz did not accompany him because she had a cold. "He made our short 18 months together one of the most intensely glorious times of my life", she said. 1959 - Eddie Fisher ... Elizabeth Taylor was already a megastar, and her marriage to Eddie Fisher was her first mega scandal. While grieving for her late husband Mike Todd, the actress turned to his best friend for comfort. The only problem was that Eddie was still married to Hollywood sweetheart Debbie Reynolds. Debbie and Eddie finally divorced and Liz married him 3 months later at Temple Beth Shalom in Las Vegas. "The press made much of Eddie leaving his wife, but Eddie and Debbie's marriage was in trouble long before", said Liz who announced her separation from Eddie in 1962. 1964 and 1975 - Richard Burton ... "since I was a little girl, I believed I was a child of destiny", said Liz. "...and if that is true, Richard was surely my fate". "it was perhaps the most passionate tumultuous romance in Hollywood history", Liz said. Liz again began a very public affair when she romanced her handsome co-star on the set of Cleopatra. 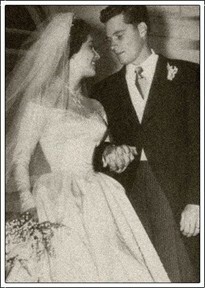 Both stars divorced their spouses, and wed for the first time in 1964. They made several films together (incl. Who's afraid of Virginia Wolf? ), and their larger than life relationship was marked by extravagant spending and ugly fights. They divorced in 1974, only to re-marry the following year. They finally called it quits in 1976. 1976 - John Warner ... This time around, Liz ditched Hollywood glamour for the serious life of a senator's wife. She helped the former secretary of the Navy campaign, win a US senate seat in Virginia. The couple divorced in 1982, but the former senator, now 84, said after her death that he and his x were always friends to the end. 1991 - Larry Fortensky ... It seemed impossible for the icon's love life to take yet a dramatic turn, but her relationship with Larry proved otherwise. The screen legend met the construction worker in 1988 at the Betty Ford centre where both were receiving treatment for substance abuse. They wed at their friend, Michael Jackson's ranch in 1991, but split in 1996.